A hidden treasure in the tropical paradise that is far north Queensland. Our fully self contained apartments offer all the convenience of a comfortable home away from home. Affordable and convenient At The Mango Tree is great value holiday accommodation with air-conditioned clean and spacious two bedroom apartments, all suitably equipped with full kitchen and laundry facilities. Hidden from view by Mango trees and nestled amidst beautiful tropical gardens, At The Mango Tree is a most suitable destination for a holiday in the tropics and only a short walk to the breathtaking beauty of Four Mile Beach or a lazy 15 minute stroll to the magical ambience of the village centre. Relax, unwind and experience the awesome natural beauty of two world heritage listed Aussie icons - where the Rainforest meets the Reef, and the friendly welcome is as warm as the tropical climate all year round. We manage eight apartments that bookable through this facility. They are all identical design and layout with some small differences. You can request ground floor with patio or first floor with balcony and bathroom with shower over bath or shower only. Some of the furnishings are different too but they all have the same facilities. Requests are always accepted but subject to availability. 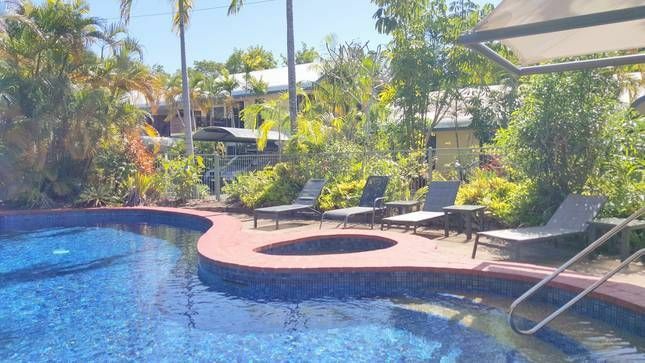 Living and working at The Mango Tree Holiday Apartments, Port Douglas for over 12 years. Never too far away and always willing and able to help you, unless we've gone sailing! Now in our thirteenth year managing holiday homes all situated at The Mango Tree Holiday Apartments. Choice of shower over bath or shower only (subject to availability).